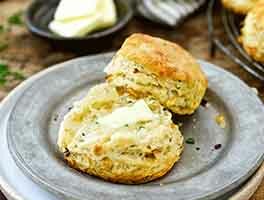 Make 'em big or make 'em small, these are zesty, tasty biscuits. The tiny ones are great as appetizers. Serve the bigger ones with soup or stew to make the meal memorable. 20 mins. to 55 mins. 35 mins. to 60 mins. 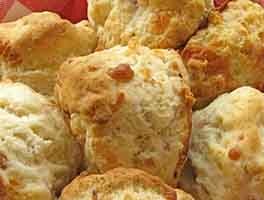 Bake the biscuits till they're a medium to deep golden brown, 10 to 14 minutes. 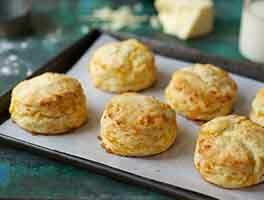 Make now, bake later: these biscuits are a great candidate for the freezer. 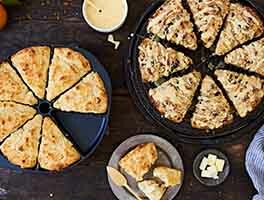 Simply make biscuits, shape, and place on a pan. Freeze, then transfer to a plastic bag for storage. When you're ready to bake, remove them from the freezer, place on a pan, brush with cream, and bake as directed. They'll take maybe 5 minutes longer, since they're frozen. I made two double batches of this recipe for a Memorial Day picnic. After three hours, there were 6 left. Enough said! So quick and easy, this is going to be a new 'go to' recipe. I prepared the recipe without adding the milk and placed it covered in the refrigerator until I was ready to bake it. I used my mini muffin tin and baked as directed . My family went crazy over these little tasty bites. I used extra sharp cheddar and mini turkey pepperoni circles. The pizza flavoring was just right. The kids called them pizza bites. I will make these again and again. I was thinking about what I could do to make a Mexican version by using spicy Mexican peppered cheese. So nice to find an easy recipe that kids like. I was also successful with this recipe !! My only tweaks were half & half as I was out of milk. Multiple compliments by the hubby!! This recipe should be in everyone's top rotation. It's a real crowd pleaser and versatile too. Super simple, throw it together last minute with whatever's in the drawer type of go-to recipe. I've made these several times for parties and pot luck, both with pepperoni and ham, and there is NEVER any left over ...and I usually start with at least a double batch! I've quadrupled it, and divided before adding the different meats to make a variety batch. Go ahead and use whatever cheeses you have. That sack of shredded italian cheese you get in the deli case is awseome in these (I usually buy the 3 cheese blend). I don't ever stock the cheese powder, but always have a block of good Romano in the drawer so I use that finely grated in place of the power. I also don't generally have the pizza flavor or herbs and it's certainly not necessary, IMO. I do recommend using the scallions, that little bit of fresh oniony flavor really make an important difference. 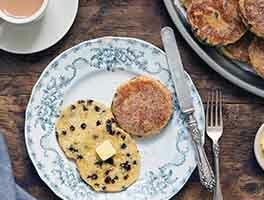 I've been making these for Sunday morning breakfast recently, using diced ham, a regular muffin pan and ice cream scoop, which makes 9 good sized breakfast biscuits, which my family of 4 devours. The bottoms are crunchy-crusty perfection and the middles are tender-flaky goodness. I top them with just a sprinkle of extra cheese too which browns up beautiful and delicious. So yes, make these. Double the batch(at least) if your feeding more then a small family, or for a party, and remember these are biscuits so don't over mix or they will be tough! These are amazing! Delicious, savory, just wonderful!!!! I have made this recipe many times now - always a crowd pleaser! The small bites of cheese and pepperoni are perfect for game day and/or an event where there's beer, wine, cocktails. What's best about this recipe - you can put it together quickly and your guests will ask for the recipe. I made these yesterday and really liked them. I was looking for snacks for a pool party that kids and adults would like and these worked out very well. I followed the recipe but did not add the scallions. I dropped little rounds of the dough on parchment and baked. Next I will make a big batch and freeze so we have some to pull out of the freezer and bake anytime. Absolutely delicious and a perfect cocktail snack. I made one batch with turkey pepperoni and one with bacon (I precooked the bacon just enough, but not too crispy). Otherwise, I prepared it all as written, including the scallions. Love it! 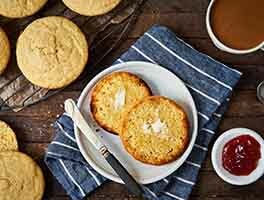 I have made these before, following the recipe, and they were great! I made them yesterday with bacon instead of pepperoni (because that's what I had in the fridge) and they were amazing!!! I did mini bites, so had 24 of them. They were gone very quickly, and everyone loved them! Will definitely make these again, when a party is in need of an easy snack.